With our CEREC technology, it’s possible to get your crown in just one appointment. We are proud to offer CEREC® one-day crowns at The Silberman Dental Group in Waldorf, MD. CEREC allows Dr. Silberman to design, create, and place your custom dental crown during just one appointment. It’s strong, durable, and aesthetic – your smile is going to love it! Why? Our free infographic will tell you! Learn the benefits of same-day dentistry and how it could be the solution you’ve been looking for! Rather than returning to our dental office for a second appointment, your crown can be made in just one visit. This allows you to save time at our office and spend that time with your family or at your job. Instead of using goopy trays to make an impression, CEREC one-day crown technology uses a special 3D imaging camera and software to design your custom dental crown. There is no need for an uncomfortable temporary crown since CEREC crafts your crowns in just a single visit. Created from porcelain, your custom CEREC crown will be tooth-colored and durable, blending in beautifully with your smile. HOW DO WE CREATE A CROWN IN ONE DAY? We will examine and prepare your decayed or fractured tooth for digital imaging. Then, we’ll comfortably take digital impressions using 3D imaging cameras and software to start designing your custom crown. This is where the magic happens. Using the 3D impressions, this incredible technology will craft your crown right before your eyes. Dr. Silberman will polish, adjust, and place your beautiful restoration in your smile. You will walk out of our office with a crown with exceptional aesthetics. HAVE ANY QUESTIONS ABOUT SAME-DAY CROWNS IN WALDORF? Consult our FAQs below or give us a call at 301-885-2505. What’s the difference between CEREC and traditional crowns? 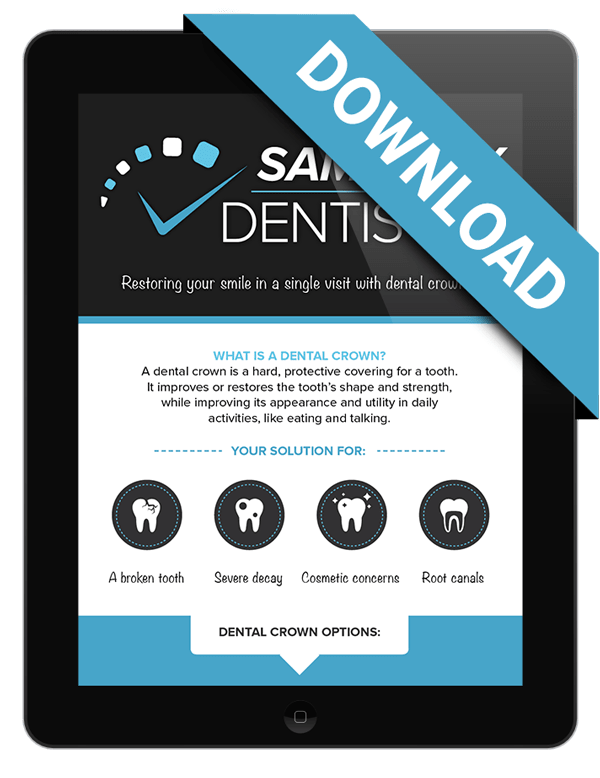 Traditional crowns: Crowns require manual impressions, multiple visits to the dentist, and the placement of a temporary crown after the tooth is prepared. We may recommend traditional crowns under some circumstances, but most times you can watch your beautiful, precise CEREC crown being milled in our office. CEREC same-day crowns: Technology perfected over the last 30 years gives dentists tools to prepare and place a permanent crown in a single appointment. A comfortable oral camera provides 3-D digital images of the tooth. The images are used to digitally design your crown. In minutes, a sophisticated milling machine creates your crown from a single piece of porcelain. All of this is done in one appointment! Talk to us today to see if this incredible procedure is right for you!